Designs are available to purchase or to rent. The Quad system attaches with magnets and changes in seconds. All Quad pieces fits anywhere on the exhibit.Coming up with a unique design for your MultiQuad is easy with a our large variety of panel options. Each panel can be a graphic, fabric, wood grain, shelf or LCD monitor. We offer a virtually unlimited number of exhibit layout options, to give you any look that you want. Your MultiQuad booth can be customized with your artwork and design, standard or back-lit graphics, big towers, and can work with any accessories. MultiQuad exhibits are created from a basic collection of components. 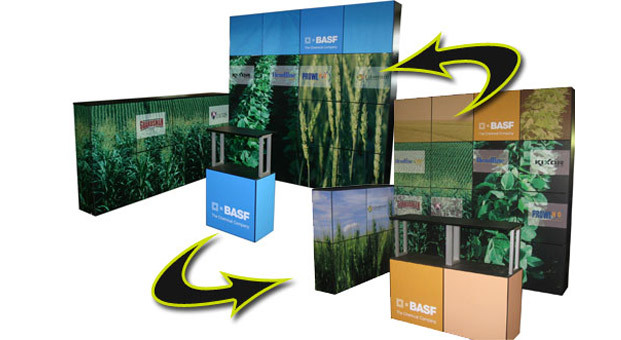 Think of components as the basic building blocks of your trade show display. 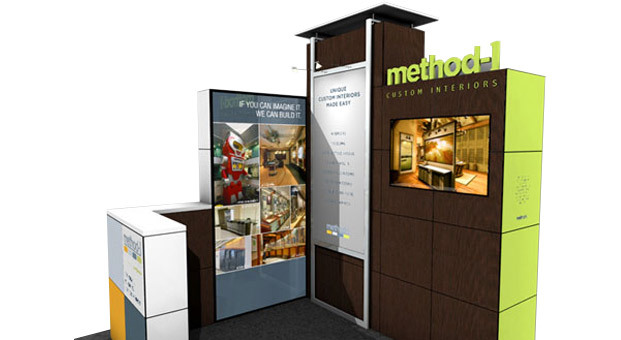 Mix and match the components to design the exhibit of your choice.